Boredom here means a lack of excitement, not a lack of any emotion. Boredom generally means a lack of any stimulation or emotion - particularly any enjoyable emotion. Here, boredom refers a lack of just one emotion - excitement. You feel boredom when you don't see new scenery. If you don't eat, you feel hunger. 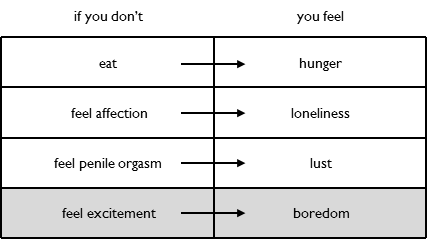 Similarly, if you don't feel excitement for a few weeks, you feel boredom. The longer it has been since you've eaten, the stronger hunger becomes. Similarly, the longer it has been since you have felt excitement, the stronger boredom becomes. Boredom is so weak compared to other emotions that it is hard to detect and isolate from other emotions. It can best be detected when it is very strong or has recently stopped being very strong. You might be able to detect boredom when you have not been away for a long time. If you have not been on a trip for 6 or more months, boredom may be strong enough that you notice it. It will feel like a dark cloud in the background, not the stabbing pain that emotions like humiliation or revenge can make you feel. You might be able to detect boredom's absence when you return from a trip. Going on a trip will stop you feeling boredom, but it will also make you feel excitement. So you can't detect boredom's absence when on a trip, but you might be able to when you return and excitement stops. If you compare how you felt at ordinary moments just before and just after returning, you may notice that you feel a little less depressed. That is the absence of boredom. Boredom should be actively managed like hunger and loneliness. If you don't actively manage your boredom, it will add to your unhappiness. It will creep up on you and become a significant problem before you realize it. It's easy to avoid boredom by ensuring that you routinely feel the excitement caused by seeing new scenery. At least once a year, you can vacation in a new destination. Every other month, you can take weekend trips to new, nearby locations. You can also steer your career towards opportunities that involve travel. And you can see movies that feature landscape scenery - particularly on a big screen. Even glossy travel magazines can provide low level excitement.